I’m in Venice at the moment and have no steady internet connection, and am thus not able to do much here on the blog. 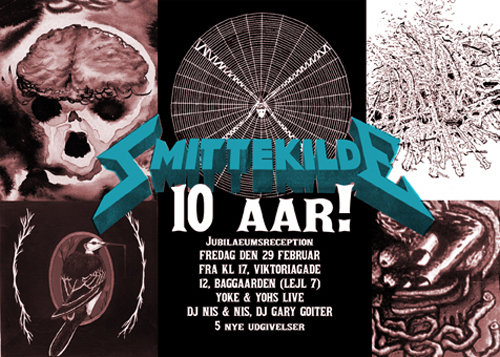 But I’d like to take the time out to advertise this: the 10-year anniversary of Zven Balslev’s quality art zine/publication, and now art publisher and record label, Smittekilde! Congrats! If you happen to be in Copenhagen, there’s an anniversay reception going on tomorrow night. Details on the flyer. Also, check out Smittekilde Records here. Roald Bergman has dug up images of the Disney cartoons recently “found” in Norway, which the “discoverer” claims were drawn by Hitler. And if you believe that, I have this nice bridge to sell you. More good stuff going down the weekend of the 8. This is in New York and looks like a must. Do go. 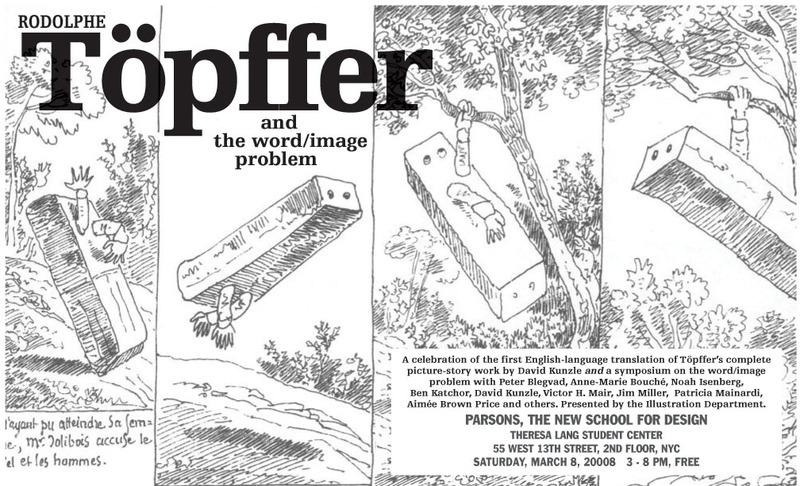 Want to know more about Töpffer? Read the Bunker’s introduction here, and the review of David Kunzle’s recent monograph on the cartoonist here. We MUST make this work. We MUST have a kind of integration where we can be both Christian and Muslim and live next door to each other. But we need unequivocal support for democracy. For our basic rights. For the equality of the sexes. And this applies to everyone in this country. Cartoon Crisis vol. 2? Not really, but things are bad enough as is. Jakob Illeborg runs informative commentary in English, while the showstopper of the week was surely the leader of left wing political party Villy Søvndal’s virulent criticism of extremist islamic organisation Hizb-ut-Tahrir and its role in the proceedings as well as in Danish society in general. And he’s been following it up in recent days (only in Danish, unfortunately, but if you read Danish and haven’t seen it, do). Comics treats! Dan Zettwoch, Kevin Huizenga & Ted May are currently ganging up on great fun facts-comics, Ron Regé Jr. has started a series of eye-popping drawings on the theme of “The Cartoon Utopia”, and there’s a new site up collecting interviews with the great Alan Moore. Walt Kelly’s test animation for a never-realised animated Pogo cartoon (part I, part II, thanks Dirk). An interesting artifact with some lovely cartooning and an increasingly relevant if somewhat hammy political message. And think about this: What do YOU reckon Albert’s voice sounds like? Fantastic Four: The Lost Adventure, out this week, reconstructs the last FF story by Stan Lee and Jack Kirby, never published in its original form, but chopped up and combined with artwork by Johns Buscema and Romita in FF #108, which went on sale the same month as Jack Kirby debuted for his new publisher, DC. 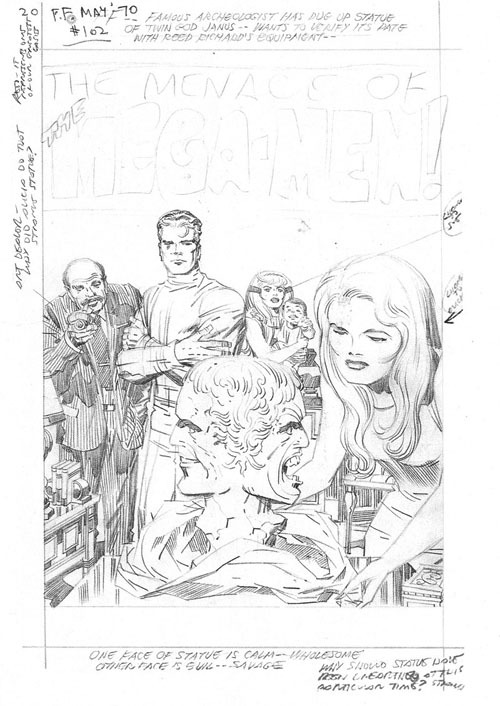 Neither version of the story — both are printed in the comic, along with what remains of Kirby’s original, uninked pencils — is one for the ages; Lee’s reconfigured version makes a little more sense and works better dramatically, but is also more banal, while the original as reconstructed here is an uninspired mess built on a rather good idea, and with a couple of standout moments from both Lee and Kirby. For more on this, see this critique by Craig Fischer (as well as this reply to it by Charles Hatfield) and this analysis by Sean Kleefeld. 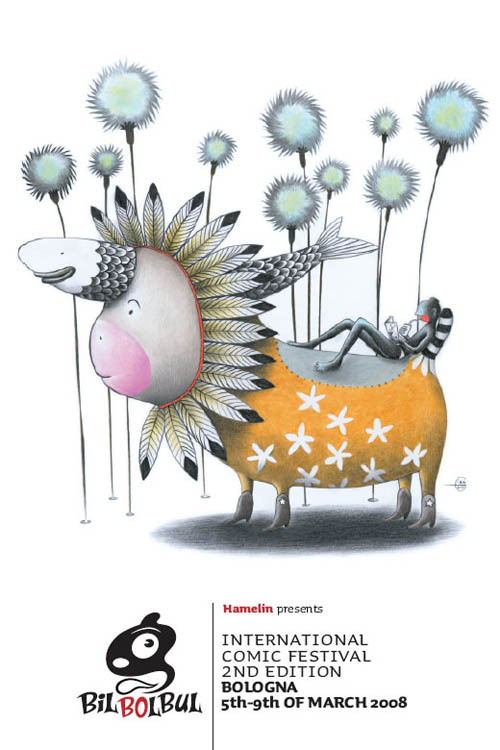 The great folks from Hamelin and Canicola are, once again, organising a quality comics festival in Bologna la grassa! It looks great; If my travel planner for Italy that weekend wasn’t already booked in another city, I’d be very tempted! Already some ways into 2008, I figured I’d still write a little something about the hip hop albums I enjoyed the most in the past year. 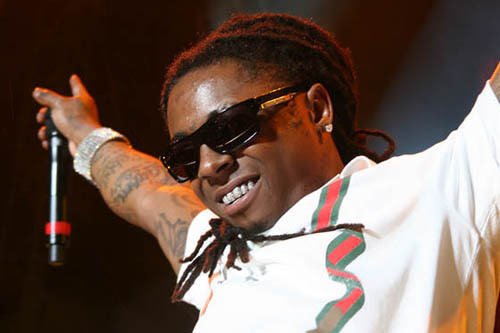 The genre is clearly going through changes, seeing not only a substantial generational shift and a geographical displacement of its creative locus to the South, but also what seems to be a return to its roots as a localized, urban underground genre as sales of high-profile mainstream material is in free fall, and the wave of innovative suburban white avant-garde hip hop of the years around the turn of the millenium has lost steam. Though the last few years have been meagre indeed, quality seems to be winning through in various places. Despite recognizing the above-mentioned overall trends, I was happy to recognise that the music I enjoyed the most the past year, at least in terms of albums, came from all over the place. Anyway, without further ado — check out the following albums if you haven’t already. The danger arises not only when there is an assumption on the religious side that membership of the community (belonging to the umma or the Church or whatever) is the only significant category, so that participation in other kinds of socio-political arrangement is a kind of betrayal. It also occurs when secular government assumes a monopoly in terms of defining public and political identity. The Archbishop of Canterbury’s highly controversial lecture on the intersection of British and Islamic law, as well as those of other religions is well worth your attention if you’re at all interested in the role of religion, and especially Islam, in modern secular society. Steve Gerber links. The passing of the mainstream comics auteur this week has prompted the posting of a good deal of interesting material relating to the man and his work. Here’s Gary Groth’s 1978 interview with Gerber from The Comics Journal, and here’s Dale Luciano’s 198? essay on Gerber’s most famous creation Howard the Duck, also from the Journal (warning: PDF). Also, be sure to read the personal reminiscences of Gerber’s friend and colleague, comics writer Steve Grant here. 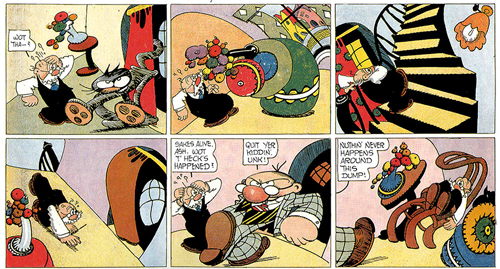 And here’s comics critic Tom Spurgeon talking about Gerber on the radio. 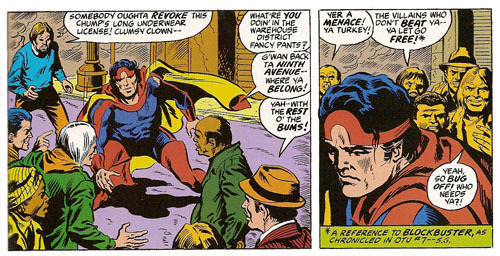 Plus, read some Howard the Duck here. Thanks to Dirk for the heads-up. Today, major Danish newspaper Berlingske Tidende prints Kurt Westergaard’s notorious Mohammed-cartoon for the very first time, alongside an editorial entitled: “No Discussion Should End in a Funeral“. Since the Cartoon Crisis began in September 2005, Berlingske Tidende has played its part in a very careful manner, similar to that of most American papers. But the murder plot against Kurt Westergaard has obviously challenged editorial positions, and accordingly, almost all major Danish papers today reprint the cartoon in an act of solidarity with Westergaard and Jyllands-Posten. 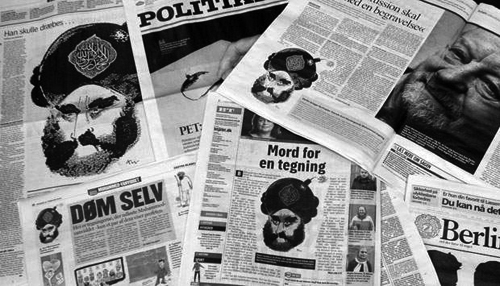 This morning, three people with Muslim background were arrested by Danish Police, suspected of conspiring to kill Danish cartoonist Kurt Westergaard, one of the 12 cartoonists that portrayed the prophet Mohammed in Danish paper Jyllands-Posten in 2005. Among the suspects are both Danish as well as non-Danish citizens. The group has been under surveillance by the Danish Security and Intelligence Service for months. 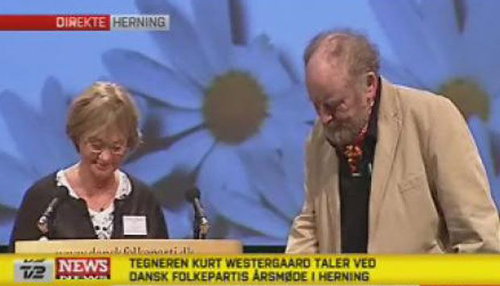 Illustration: The most famous and emblematic Mohammed-cartoon was drawn by Kurt Westergaard. Mr. Westergaard wanted to point out how the Prophet is exploited to legitimize terrorism, but obviously many have seen the cartoon as a depiction of the Prophet himself as a terrorist. Mainstream comics auteur Steve Gerber, creator of Howard the Duck and Omega the Unknown, passed away Sunday night. Tom Spurgeon has as fine an obituary as you’re going to find up, providing an appreciation of key works and a career overview. Mark Evanier delivers the more personal perspective and friends and fans congregate at Gerber’s site. Also, this essay on his genre-challenging run on Marvel’s The Defenders is worth reading. Image from Omega the Unknown by Gerber, Mary Skrenes and Jim Mooney. Ny Alliance: taberholdet i dansk politik — who makes the cut? 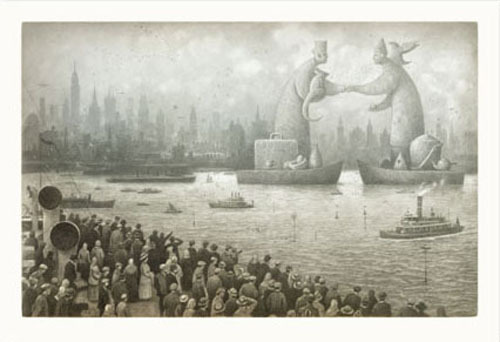 The Arrival by Shaun Tan is the most overrated comic of the past year. Published more or less simultaneously in several languages, it seems to have received unanimously positive, bordering on rave, criticism since it came out — from the mainstream press as well as the comics cognoscenti. To cap things off, it was awarded the Book of the Year-award at Angoulême. Yet, it is little more than a big fat sap sandwich.